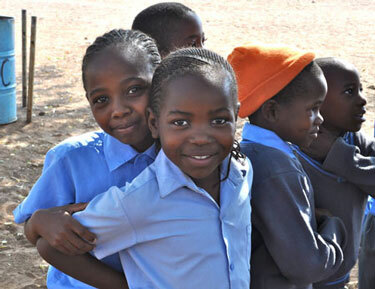 This past summer, we traveled with our family to southern Africa. We’d been begging to go on this trip for what seemed like ages, and finally, it was just around the corner. We had safaris, a cage dive, excursions, and all other activities under the sun planned for this trip of a lifetime. However, we felt one thing was missing from our already-loaded itinerary: spending time with the locals. We wanted the full Africa experience and it could not be completed without interacting with the native Africans themselves. Being the mission trip junkies that we are, we thought going on a mini-mission trip would be the ideal way to get the opportunity to experience the vibrant culture and people of Africa (and giving back while doing so is always a plus). 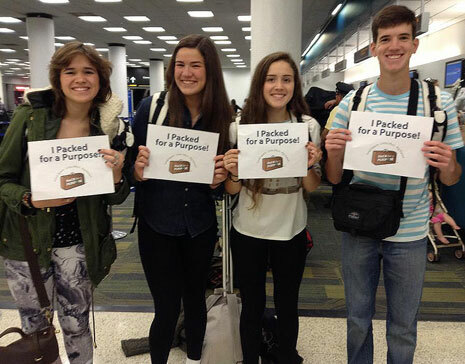 So, thanks to the internet, we stumbled upon this incredible organization, Pack for a Purpose. 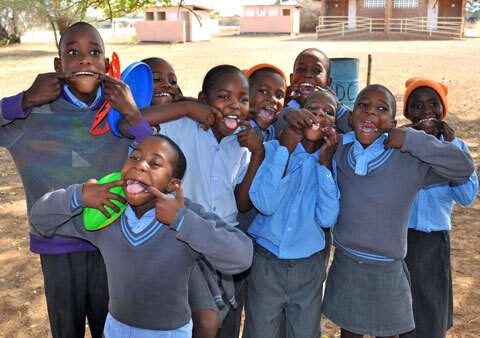 We saw we were traveling to Muchenje, Botswana on safari at the Muchenje Lodge, and that this organization offers exactly what we were looking for—an interactive experience with local school children and a chance to donate supplies they were desperately in need of. We immediately contacted Pack for a Purpose and made the necessary arrangements to be able to participate in this unbelievably excellent program. We set aside ten pounds to pack items for these children who reside only one ocean apart, but live in a completely different world which we did not see coming. As Miami teens who are privileged enough to attend high school, we often times take for granted the little things we have, like a paper notebook, a measly pen, or a flimsy folder. As a matter of fact, our schools have gone very technological, where the children use iPads, and notebooks, pens, and folders are things of the past. Anyway, we packed school supplies like protractors, rulers, notebooks, pens, and pencils. We also brought some sports gadgets like jump ropes, frisbees, footballs, and soccer balls graciously provided by the crew at soccer.com. With that, we packed our bags and headed over to Africa! When we arrived at the Muchenje Lodge, we couldn’t wait to meet the kids and get a taste of life 8,000 miles away from home. Once we got to “town,” we noticed the changes in scenery from our luxurious lodge. It really hit home to see how underprivileged these people are. Upon arrival at Mabele Primary School, we met with the charismatic Headmistress. We prepared to distribute the goods and have some time to hang out with the students. We walked through what was considered campus and entered one of the classrooms. We stepped into a room full of eager school children, all of whom were participating in class using remarkable English. We were immediately stricken with a wave of emotions and became attached to these awe-inspiring children. They were so happy for to have so little and fully embraced the loosely tossed-around saying that goes “count your blessings.” We handed them their supplies as we listened in on their lesson in multiplication and division. 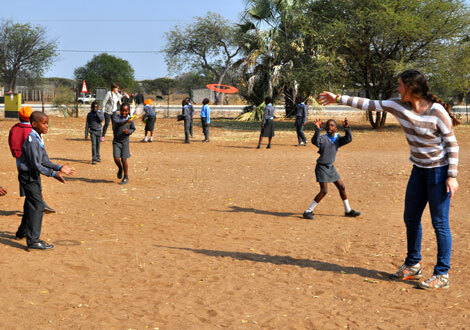 After class, we ran out with the children onto their field—a barren designated play area. We tossed around the frisbees and played a small soccer match. We can speak for all of us and the schoolchildren when we say that we were in nothing less than a state of bliss. Together, we forgot about our first- or third-world problems and shared a bond that was something very special. At the day’s end, we posed for photos, wiping tears from our cheekbones as the little ones propped themselves up on our shoulders. We were sad to say goodbye, but those children were so happy with their new school supplies and new friends, that leaving them wasn’t the worst feeling in the world. We were so grateful to have been able to make a difference in the lives of those school children in Muchenje, and we received the cultural experience we’d only ever dreamed of. We wholeheartedly thank Pack for a Purpose for allowing us to have embarked on this occasion that we will never forget. 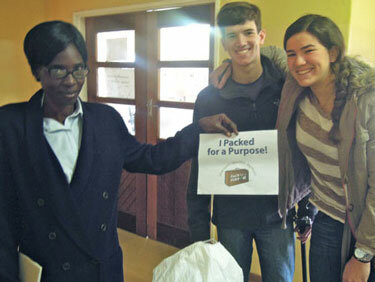 We will forever have a piece of Muchenje in our hearts and can’t wait until the next time we can Pack for a Purpose!